Does a woman’s pregnancy affect the weight of her partner? And is weight gain sustained while the kids grow up? Anecdotally, many people would undoubtedly say yes from their own experiences. Lack of sleep, less time for exercise, and having a cheeky bite of junk food with the kids all add up in a serious way. We poke fun at the ‘dad bod’, but is it a real phenomenon among fathers? This is actually a difficult question to answer. The transition to parenthood occurs over time. As we also inevitably age over time, our metabolisms sadly slow down and we usually gain weight. So, how to disentangle the causal effect on weight gain of becoming a parent versus simply getting older? A study published last week in the American Journal of Men’s Health set out to answer this exact question. They investigated the effect of the transition to fatherhood on young men’s body mass index (BMI) at the population level in America. Data were from the National Longitudinal Study of Adolescent to Adult Health, a nationally representative study of 10,263 young men aged 12-21 years old when the study began in 1994-1995 (1). They followed the men up for over 20 years, until they were aged 25-34 years old in 2007-2008. The authors assessed the men’s BMI, whether and when they had had children, and many other important demographic and lifestyle factors. Men were grouped into three categories: resident fathers, non-resident fathers, and non-fathers. The trajectory of standardized BMI over time is shown below. Time is shown in “Fatherhood years”, where negative years are pre-birth of the child, 0 years is at the birth of the child, and positive years are post-birth of the child. The ‘Fatherhood effect’ was an average weight gain of 4.4 pounds (2.6% increase in BMI) for a 6-foot tall man becoming a first-time dad and residing with his children. First-time dads who did not live with their children had a 2% increase in BMI, on average, from the time they became fathers. For a 6-foot tall man, this translates to 3.3 pounds gained. 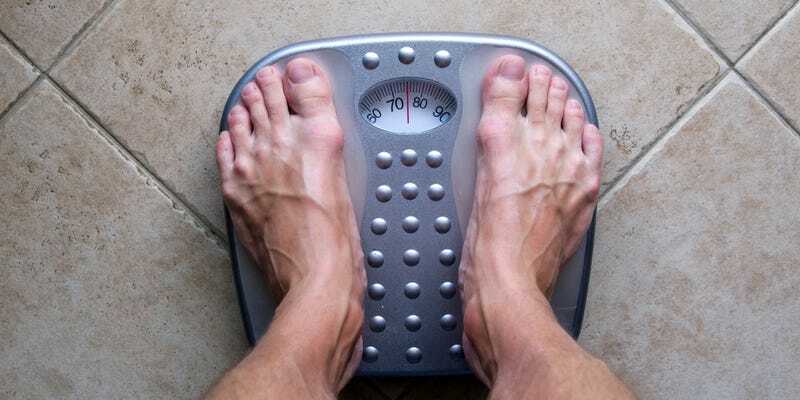 During the time period when the fathers gained weight post-birth, the childless men actually declined by about 1% in BMI until the end of the study. For a 6-foot tall man, this translates to 1.4 pounds lost. Weight change in the non-father group was attributable to age (there was a small overall increase in BMI in this group, despite the slight decline in the latter half of the study), while additional weight change in fathers was attributed to the life transition of having children (1). Fatherhood can affect the health of young men, above the already known effect of marriage. The more weight the fathers’ gain and the higher their BMI, the greater the risk they have for developing heart disease as well as diabetes and cancer. You have new responsibilities when you have your kids and may not have time to take care of yourself the way you once did in terms of exercise. Your family becomes the priority. We now realise the transition to fatherhood is an important developmental life stage for men’s health. It’s a magical moment where so many things change in a man’s life. Now the medical field needs to think about how can we help these men of child-rearing age who often don’t come to the doctor’s office for themselves. There you have it. The ‘Dad Bod’ is a real phenomenon, and not just a joke on social media. Weight gain associated with life transitions such as parenthood is a real concern, and public health, social, and clinical supports should be available for men during this time. This article first appeared on PLOS Blogs and republished here under Creative Commons license.